I’m in Innsbruck, covered in dust, sweat and wood shavings. Unbelievably, I’m about to put the finishing touches to a pair of skis that I’ve made with my own bare hands, and I can barely put a shelf up at home. How the hell did this happen? First, a little history. Fifteen years ago ski and snowboard catalogues showed similar-looking equipment, dominated by a few major players. And today? Thanks to the internet, which enables small producers to sell their wares to a global audience, the market is a far broader place where new shapes can be launched mid-season, and custom-made equipment is just a few clicks away. From getting Japanese shaper Gentemstick to make you a powder board to emailing your own graphics to Mammoth-based Community Skis, it’s never been easier literally to tailor your mountain equipment to your exact needs. Which brings me back to the workshop on the north side of the River Inn. Before arrival, I’d had a phone consultation with Mickey, and told him that I’d loved the Rossignol Soul 7, but wanted something that worked better on piste. Mickey’s incredible knowledge of skis meant he could roll off the Soul 7 measurements like he was reading them out of a brochure. On arrival, I’m excited to meet my ski – albeit a paper printout (to the exact measurements agreed with Mickey) glued onto a hardboard rectangle ready for me to bring to life. I look around the two-storey workshop – tools lined up in perfect order, and the wood cores, steel edges and top sheets laid out ready for my group’s workshop. All with some lovely touches – cupboards held together with ski-boot clips, the recycling areas, the honesty bar. It’s like walking into a real-life Pinterest board named ‘cool ski DIY’. “And also whether you finish the skis with a veneer or not,” says Paul. On my course are five other debutants from Germany and Austria (“an unusual mix,” Paul tells me later that day, “usually we have some Brits, Americans or Aussies”). Not that the nationalities matter. Peter Pfeifer, our course leader for the weekend, takes us through each step of the building process in English. The course starts on a Friday night, and from 6pm to 9pm we cut and sand our hardboard-backed printouts into the 2D shape of our future skis. On Saturday we use that template to cut out the base material, and superglue the edges into place, then sandwich the rectangular wood core and fibreglass together. The whole lot is then covered in glue and shoved into a vacuum bag, which creates enough downforce to seal the skis, while simple G-clamps and strategically placed curved wedges give my skis some nose and tail rocker and 8mm of camber underfoot. 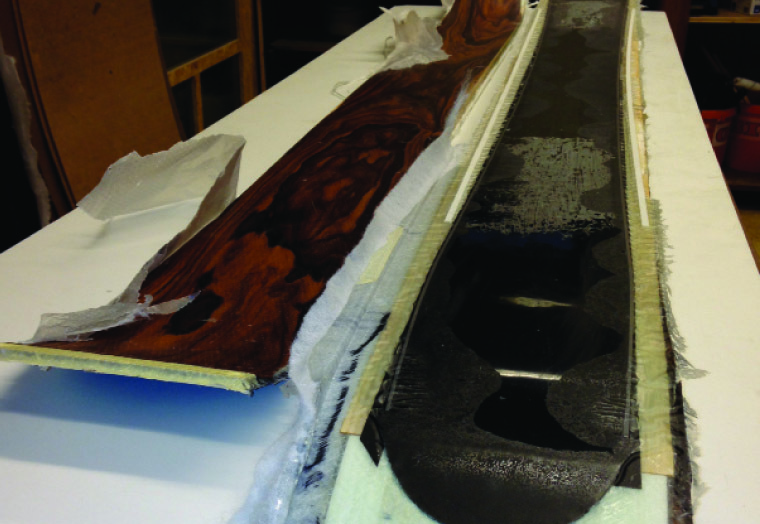 Overnight the skis harden in the oven and, by Sunday morning, a three-dimensional, solid rectangle of material – with the base and edges visible as skis underneath – is ready to be finished off. a seven-year old at Christmas. Suddenly, they’re finished. It’s 4pm on Sunday, I could definitely do with a shower, and I’ve had more espressos than George Clooney doing an all-nighter to Lake Como in a transit van, but I’m ready to hit Facebook like the Lion King showing off Simba for the first time, and then, of course, to get the skis to the nearest resort. Days later, I’m on a chairlift in St Anton, and what can I say? They are by far and away the best skis I’ve ever been on. Mickey is a genius. 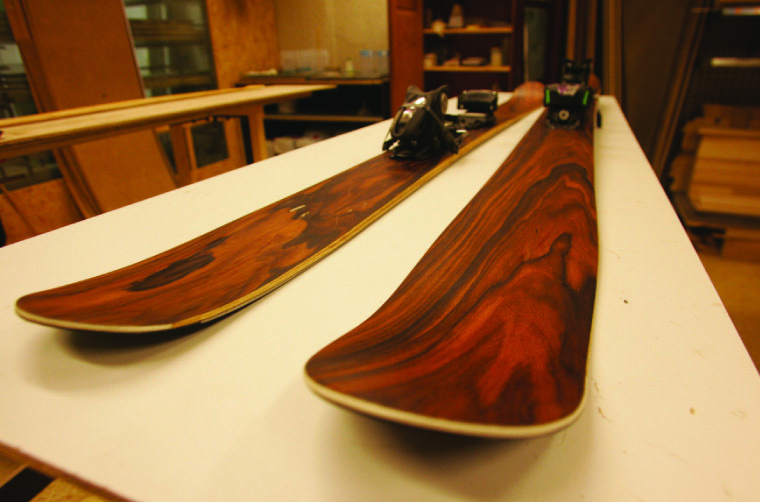 Wood skis feel epic – more solid, quieter in the chatter, and springier than regular skis. And the Pinocchio-like bond between us means I’ll never abandon them, or throw them in a car, or go near a crowded lift line. All that, and they could go on the wall of a chalet and look pretty cool too (if only I had a chalet). To book on the ski building course visit spurart.com. For accommodation in Innsbruck visit innsbruck.info.